Anzac Day is here again and always brings many emotions bubbling up for me. It has always been a very important cultural commemoration in my family. I can’t listen to the “Last Post” with out tears coming to my eyes, my thoughts always go to all those families, across time, that have been shattered by war. This is always a difficult discussion to broach with children. We, as educators, support and foster the ideas of shared decision making, tolerance, understanding, friendship, building positive relationships and fairness in our learning environments. Anzac Day and discussions of war seem, on the surface, to fly in the face of these concepts. Discussions of adults going to war, fighting and dying are complex, difficult for all to come to come to terms with, child or adult. However, as always with the human spirit, in times of great adversity we rise to meet the challenges. I like to focus on the importance of commemoration, why we remember. How, by never forgetting, we honour those who were lost in body but not in spirit or memory. We also honour and pay respect to all those who showed courage in times of great suffering and sacrifice. I also feel that Anzac Day is a day to focus on Peace and how we can attempt to stop such devastation happening again. No soldier or person touch by war believe in its celebration, so let us focus on how, in remembrance, we can change the future. By supporting our children to have strong sense of self, be understanding and accepting of others, to negotiate with and respect others, we and they are contributing to that future. As Tolstoy suggests “Everyone wants to change humanity but nobody wants to change himself”… let us start that change and help our children understand that they can and will make a difference…that they are truly connected and contribute to OUR world. I also like to focus on the many customs that surround Anzac Day. I would like to share one our families favorite traditions for Anzac Day. 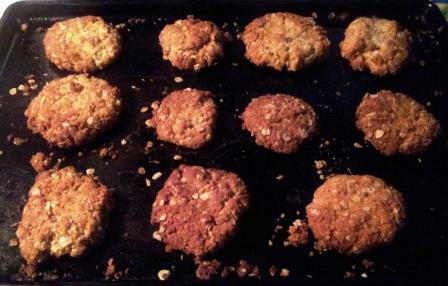 Ever year we make Anzac Biscuits together (actually, we make Anzac Biscuits quite regularly!). We discuss the history surrounding this iconic Australian treat. Please feel free to download and print of the planned learning experience below. Rose3 Members can access other Anzac Day information sheets and learning experiences from the website. ← Know all your letter names before you’re 5…it is required!